What is freedom? It sounds like an easy question, but what does freedom mean to you? Are you free? I mean really free? It can be really difficult to think about freedom, especially any lack of it because we are so conditioned and habitual in our daily lives. We conduct our lives within the framework of freedom that we have grown up with, within the structure of our culture. Because we have grown up this way the boundaries and limits imposed on us have become more or less invisible and normal, we don’t really notice any limitations or lack of freedom. But we do have limitations and restrictions on our freedom. Most are quietly hovering in the background, not too obtrusive but there nevertheless, watching, compiling and following. Examples would be RFID (tracking) tags embedded in all sorts of consumer products and clothing, cell phone tracking, GPS chips implanted in our vehicle’s computer, chips implanted in passports, driver’s licenses, and credit cards, security cameras at every intersection (look up), facial recognition software in public spaces, and government eavesdropping on every phone conversation, email, or text you send. This isn't the future, this is now. This is our reality. This is where we find ourselves at this particular time in our history. But this isn't a rant against our government or society. It is a commentary on freedom. I’m not advocating revolution, I am advocating awareness. Be aware. 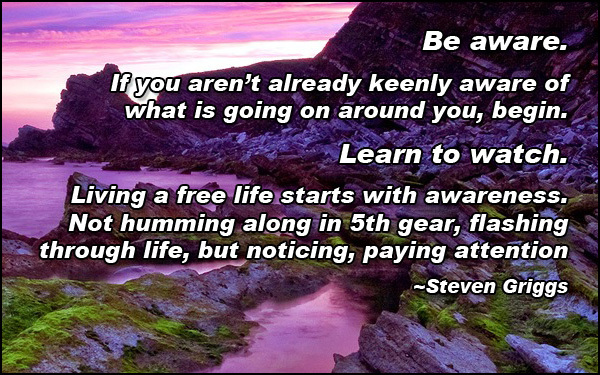 If you aren't already keenly aware of what is going on around you, begin. I define freedom as the lack of restriction. The definition of restriction is limitation and the definition of limitation is restriction. They are one and the same thing. There are two ways you can be restricted: in your mind and in the physical world. We've talked about externally imposed restrictions and those aren't going away. That leaves our internal restrictions. It is our internal restrictions that we need to understand and if we desire true freedom from restriction or limitation, that’s what we need to work on. That's where it all starts. For example, in my article 15 minutes to freedom. I talk about being able to drop everything and leave for the airport in 15 minutes. I know that this is unrealistic for most people, probably even for 99.9% of us but it is a way to gauge your level of flexibility, or conversely, your rigidity. You are probably thinking that not a lot of people really want to jet off to a far corner of the earth on 15 minute’s notice and I agree that this is an extreme example but it can serve as one end of the scale, yes, perhaps the far end…..
Stuart Wilde talks about how most of us live in tick-tock, the 9-5 daily grind, within the dull hum of repetition and habit, the comfort of routine. You might be saying you are not in tick-tock because you’re self-employed or you have a great degree of freedom in your daily life and don’t really see it as anything rigid. But again, I am not talking about a factory type of rigidity. I am talking about more of a sleep walking type of existence, the same thing every day in slightly different mixtures, in slightly different settings, in slightly different contexts, but nevertheless mostly the same thing. We settle into a life that has become a quiet monotone of comfortable repetitions. Please don’t misunderstand me, I’m not judging or attaching anything negative to any of this. I’m just like you. I have created my life structure, heaped on a ton of responsibilities and made many commitments. I've coasted through many, many years in a safe, comfortable routine. But I have decided to wake up, lessen my burden and restructure to create a more fluid and flexible lifestyle. We have all “created” our life. We have created obligations and a life structure that is not easily changed at the drop of a hat. We have a mate or partner, children, maybe grandchildren, a home, financial obligations, and commitments. Maybe your life is exactly the way you want it to be, if so, fantastic. But maybe, if you’re like me, you have begun to question your structure and are beginning to see how it has weighed you down and actually encroached on your freedom. You know you need to make changes. First it is crucial to create a picture of what you want your life to look like and then to see where you are now in terms of your vision or plan for your life. To help in doing that let’s create a freedom scale, a way to help us take a look at how we stack up on the freedom scale. Let’s place the extreme of 15 minutes to freedom at one end of the spectrum, say at 10, this being the most freedom and Stuart’s “Tick Tock” life which has the least amount of freedom and place it at 1 on the scale. Now look at your life. Where would you place yourself on this scale? Are you in the middle, at say a 5? Or are you closer to 3, where you have less freedom? Or maybe you are at a 7 with a larger degree of freedom? Please remember that this is just a way of getting a snapshot of your current level of freedom. This is a way of setting up a basis for contrast, to see where you are now and help you to get a picture of where you want to be. And again, I’m not saying you have to dump everything today and leave for Greece. There are many ways to adjust your current situation without massive changes, without upsetting all your constituents. The first step to move our freedom needle towards 10 (maximum freedom) involves gaining control over your mind. You must free your mind from the programing you have received since childhood. You cannot be truly free if you are stuck in old, repetitive patterns. 1. DETACHMENT. Learn to detach from outcomes. 2. INTEGRITY. Build integrity, keep your promises. 3. ACCEPTANCE. Learn to define nothing, accept what is. 4. DISCIPLINE. Become disciplined. Control your thoughts & actions. 5. NATURE. Become aligned to nature. Remember where we came from. 6. LIMITING BELIEFS. Learn how to release limiting beliefs. Open up. These are not really steps but processes that address your mind, the mental aspect of you. I will address the other aspects of each of us in a later article. Since you never really “get there”, you just continually apply these processes. If you make these your habits, the way you operate, they will become more and more automatic. The next step, number 7, would be your living, how you make your money. How do you make a living? Most of us have or have had jobs. We have worked for someone else. Can you be free working for someone else? To a degree. Does this mean you have to quit your job and start your own business? Not yet. True, to be at a 10 in terms of the freedom scale, you would need to be self-employed. But there is more to it than that. Simply having your own business does not make you free, actually unless it is the right kind of business and run in the right way, you will be less free than if you were working for some else. It can become a trap. The ideal business must give you not only financial freedom but time freedom and location freedom, I call it FINTILOC™. I will talk more about these 6 steps to help your mind, your mental aspect and the Money aspect of our life in later posts. In the meantime, begin paying attention. Become more aware.